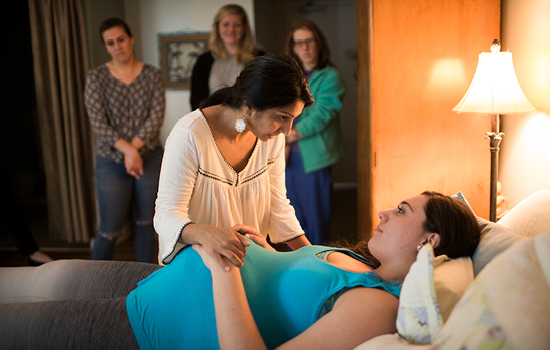 Months before Margaret Mae Mutic was born last fall, she was part of Emory's nursing family. Her parents, Abby and Nathan Mutic, are researchers in the School of Nursing, and the midwives who cared for Abby, who coincidentally is also a midwife, are graduates of the school. Just as important, these same alumni are educating future midwives through a new clinical partnership involving their practice, Atlanta Birth Center, and the School of Nursing. The center's midwives—Anjli Hinman 06N 08MN, Sara Edwards 94MN 94MPH, Crystal Bailey 06N 07MN, and Erin Graham 12N 13MN—teach a class onsite on labor techniques and out-of-hospital birth for Emory nurse-midwifery students. They also serve as student preceptors and help conduct simulation training at Emory. The collaboration is a natural one, given each partner's commitment to growing nurse-midwifery as a practice specialty and health care option for women. Open since last summer, Atlanta Birth Center is the only freestanding birth center in Atlanta and one of 300 such centers nationwide. "We want students to experience what the birth process looks like in a wide range of midwifery models of care and settings—from labor and delivery units, obstetrical practices, and health departments to urban and rural communities," says Carolyn Clevenger 02MN DNP GNP-BC AGPCNP-BC FAANP, associate dean for clinical and community partnerships. "Atlanta Birth Center provides yet another way for students to learn about the birth process outside of the hospital setting." It also helps fill a critical health care need. According to the American College of Nurse-Midwives, nearly half of all U.S. counties lack a single obstetrician/gynecologist, while 56 percent are without a nurse-midwife. To fill the void, Atlanta Birth Center uses a holistic approach to pregnancy and childbirth and focuses on educating future midwives. Emphasizing nurturing hands-on care before, during, and after birth, the practice model is guided by each woman's needs. Center midwives develop trusting relationships with families that result in confident, supported labor and birth where medical intervention is the exception. The model centers on the body's natural biological processes for birth. Women have more birth options, such as water births, and a greater sense of control over health care decisions. "Our goal is to be a sanctuary that nurtures the lives of women and their families," says Hinman, co-founder and executive director of Atlanta Birth Center. "We are here to provide a community where birth is embraced as the most fundamental part of a conscious and connected human experience."